Many visitors coming to the Outer Banks from the west or the south have most likely spent a chunk of their journey driving right through the refuge, and unless they noticed the small brown signs along the way, may not have even noticed it. The refuge spans over 152,000 acres, or approximately 28 miles north-to-south and 15 miles east-to-west. Most refuge visitors will only discover or travel through certain areas, such as local nature trails, popular fishing and hunting spots, or scenic picnic areas adjacent to the highway. But dig a little deeper, and you'll find acres and acres of some of the most unique landscape along the "Inner" Banks, large concentrations of threatened or endangers species, and a whole new perspective on the Outer Banks wildlife scene. For years before the wildlife refuge was established, this stretch of wetlands, swamps and maritime forests were considered by vacationers and Outer Banks locals alike to be a vast and desolate no man's land. In fact, throughout the entire Dare County mainland, despite the gradual settlements that were popping up on the coastline, only a cluster of residents took up residence, forming small towns along the Pamlico Sound borders of the refuge. These initial communities became the towns of Manns Harbor, Stumpy Point, Engelhard, and Swan Quarter, and even today these small villages, which are roughly 10 miles apart from each other, have remained tiny towns comprised almost solely of locals. Visitors to the refuge may find a side trip to these towns a worthwhile charm, as they have all the allure of a small local fishing village, but are also home to some of the only amenities in the refuge, including gas stations, grocery stores, and convenience stores. In the late 1970s and early 1980s, however, conservationists began to take notice of the area for its unique collection of marshes, forests and wetland habitats. In fact, upon further research, it was discovered that this virtually uninhabited parcel of Dare County mainland was home to one of the most unique habitats in North Carolina, the "pocosin," and was subsequently a thriving home for a number of species that were hard to find anywhere else along the East Coast. Pocosin is specifically a unique form of wetland environment, and comes from a Native American term which roughly translates to "swamp-on-a-hill." A pocosin habitat has poorly drained soils which are incredibly high in organic material. As a result, in wet rainy weather, the area has deep peat deposits which can retain large quantities of water. In dry conditions, the area is very susceptible to wildfire and can literally slowly burn for months. Case in point, in 2009 a wildfire that began in the refuge literally burned for almost two months, with multiple flare-ups as the hot summer temperatures and dry weather conditions continued, until it was finally contained. As a result of this pocosin discovery, the Alligator River National Wildlife Refuge was established in 1984 with the mission to preserve and protect the unique habitat and all the associated wildlife species that called it home. Soon after the refuge was studied and established, researchers found that the thousands of acres were actually comprised of a variety of coastal habitats, including both high and low pocosin, bogs, both fresh water and "brackish," or mainly saltwater, marshes, hardwood swamps, and Atlantic white cedar swamps. As a result of these unique environments, a number of plant species thrive, including pitcher plants and sun dews, low bush cranberries, bays, Atlantic white cedars, pond pines, gums, red maples, and a wide variety of herbaceous and shrub species common to the East Coast. The scenery also presents some of the most remarkable (and occasionally spooky) natural settings and landscapes for refuge visitors. Along the brushy and woodsy areas, visitors can stroll under towering pines until they encounter large fresh or saltwater ponds, brimming with migratory birds. Deep within the refuge, visitors will discover giant black gum trees, with trunks as wide as tractor tires, reaching out of expansive brackish swamps, and making a makeshift forest of winding and towering trees hovering above the dark brown waters. This eerie but incredible sight can only be found in a few places in the East Coast, most notably at the Alligator River National Wildlife Refuge and the neighboring Great Dismal Swamp near Edenton, North Carolina, and while it can be a little intimidating, it is most definitely worth the trip for experienced kayakers or even hikers in hip waders. Most visitors, however, are content to stick along the parameters of the refuge, where they can view acres upon acres of saltwater marshes, small estuaries, wet woodlands, and all the critters that come with the territory. The Alligator River National Wildlife Refuge has several claims to fame, including its status as one of the last remaining strongholds on the Eastern Seaboard for Black Bear. In fact, visitors driving along US 264 and US 64 often spot the small bears lounging alongside the highway or barely visible along the bordering woods. In addition to the black bear, refuge residents include raccoons, rabbits, energetic river otters, and even American alligators. As it turns out, this section of North Carolina is one of the northernmost homes for alligators, and though rarely seen, an occasional visitor may catch a glimpse of one burrowed beneath the surface of the brackish waters. Visitors who are driving by should also be on the lookout for a number of turtles, which are perched on logs and branches throughout the bordering highway canals throughout the spring and summer months. In addition to these mammals, reptiles and amphibians, the Alligator River National Wildlife Refuge is also the temporary home to over 200 species of migratory birds, including decks, geese, shorebirds, woodcock, and even white swans. As a result, the local swans have become a popular attraction to refuge visitors, as they can be seasonally observed in the hundreds if not thousands, wading in large saltwater and freshwater ponds throughout the area. Perhaps the biggest success story of the refuge, however, it one of its proudest inhabitants, the red wolf. The red wolf is one of the most endangered species in the world, and after centuries of hunting, the routine clearing of forests, and subsequent development, its numbers had dwindled to the point that by 1970 there were less than 100 wolves left, confined to small areas of coastal Texas and Louisiana. To preserve the species, the U.S. Fish and Wildlife Service captured as many species as possible from 1975 - 1980 and began captive-breeding programs with the hopes of someday re-releasing the species back into the wild. The plan of action worked, and the original captured 17 red wolves have reproduced and can now be found, temporarily relocated, in 35 state zoos or environmental centers. Beginning in 1987, red wolves began to be released into the actual wild in coastal North Carolina, specifically at the Alligator River National Wildlife Refuge, where they have subsequently thrived. In fact, the U.S. Fish and Wildlife Service estimated that 100-120 red wolves now call the refuge home, with the numbers slowly but steadily growing. To celebrate their presence at the refuge, the Alligator River National Wildlife Refuge features seasonal "Howlings" where visitors can learn more about the red wolf program at one of the only places in the world where they still live in the wild. In addition to garnering a little education about the species, visitors will meet at the Creef Cut Wildlife Trail and will have an opportunity to hear the harmony of red wolf howls coming out of the refuge. The program is free for children, and is held in the evenings from April until December, generally during a full moon. The Alligator River National Wildlife Refuge is open to all visitors year-round, and attracts countless types of Outer Banks adventurers, including birders, photographers, hikers, and hunters and fishermen. Hunting is especially popular on the refuge, and is allowed in most areas during the North Carolina state regulated seasons, providing that the hunters follow state guidelines. A permit is required to hunt in the refuge, and while the most popular species to hunt is the abundance of white tail deer, hunters will also find an assortment of small game species including rabbits, quail, doves, and even squirrels. Fishing is also allowed in the refuge, and a number of intrepid fishermen head to the small marshes and larger waterfront bodies of the refuge, such as the Stumpy Point Bay, to reel in small species of game fish. There are also several popular docks or "fishing holes" located along both US 64 and US 264, and all a visitor has to do to find them is to look for the fishing poles on the side of the highway. Like hunting, a permit is required, and all hunters and fishermen are cautioned to follow refuge regulations, including only hunting or fishing during daytime hours, keeping dogs on a leash, no overnight camping or fires, and basically leaving the refuge exactly as you found it - take nothing in, and take nothing out. While adventurous explorers may want to try their hand at tackling the unmarked territory that winds through all 28 miles of the refuge, most visitors will want to stick to the trails, and the Alligator River National Wildlife Refuge has three nature trails to choose from. 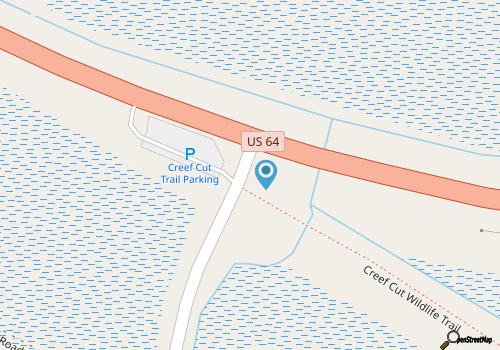 The Creef Cut Wildlife Trail and Fishing Area, where most seasonal programs are held, is fully handicapped accessible and features a ½ mile well-paved trail that eventually leads to a long, 250 ft. boardwalk overlooking a freshwater marsh. Ideal for birders, visitors to this trail can expect to spot plenty of waterfowl, as well as the occasional black bear in the winter months. Next to the trail is a handicapped-friendly fishing dock, which is open year-round to the public and is a popular fishing hole with the Dare County locals. The Milltail Creek Canoe and Kayak trail allows kayakers or small boat owners to explore the salty waterways the run throughout the refuge. Located at the southern end of Buffalo City Road, this "water" trail veers out into four separate routes spanning a total of 15 miles. Easy-to-see markers are located throughout all four trails to guide visitors through the deep yet desolate waterways that snake through the refuge. The Sandy Ridge Wildlife Trail is a little out of the way, but is ideal for hikers who adore a challenge. Makeshift bridges lead visitors through some of the trickier marshy areas, however the trail leads from slightly wooded areas through thick, muddy parcels of land, so hikers should be sure and bring their waders. The reward is the potential to spot some of the elusive red wolves, who, although shy around humans, make infrequent appearances in this area. Keep your ears open - even if you don't spot a red wolf on this trail, there's a good chance you may hear their faint howling in the distance. Make sure that you have had a chance to review the regulations or guidelines, especially if you are plan to hunt or fish in the Alligator River National Wildlife Refuge. (A permit is generally required for both activities.) Remember that camping and fires are not allowed, and it is illegal to litter, cut down timber, or remove certain plant life from the area. US Park Rangers regularly patrol the area to ensure that these guidelines are being followed. Load up on the bug spray. Even in the colder winter months, the marshiest areas of the refuge can still be home to hungry mosquitos or biting flies. In the summer, you'll also want to bring along plenty of sunscreen or a hat as the hot North Carolina sun can certainly affect refuge visitors. If you're planning a deep trip into the woods, off the marked trails, be sure and bring a cell phone, a GPS, or let someone know beforehand where you are exploring. With hundreds of undeveloped acreage, and few outposts outside the borders of the refuge, it's important to make sure you don't get lost, or at least have a Plan B handy in case you do. When driving along US 64 or US 264, keep a lookout for deer, black bear, and even red wolves that may dart across the highway, particularly at night. Visitors will notice yellow caution signs along the more populated wildlife areas, and are advised to follow them and be consistently observant. The Alligator River National Wildlife Refuge offers tons of seasonal events, from regularly scheduled "Howlings" to special birding events that are tied in with the annual Wings Over Water festival held in the fall. For a completely unique and natural twist on the standard Outer Banks beach vacation, consider taking part in one of the U.S. Fish and Wildlife Service sponsored events. Check out their calendar online at the refuge's homepage, or contact the Outer Banks Visitors Bureau or U.S. Fish and Wildlife Service directly for more information. The Alligator River National Wildlife Refuge is a not-so-hidden gem on the Outer Banks coastline, comprising a whopping 152,000 acres, but less than half of the population of a major OBX beach town. Nature lovers who love a good adventure, birders who want to spread their winds, and visiting fishermen or hunters who want to explore new ground, will love a side trip to the refuge, which can accommodate all these interests and so much more. As a revolutionary home for endangered red wolves, a permanent habitat for the East Coast's black bears, and a rare example of a thriving pocosin landscape, the refuge is truly a collection of unique worlds combining and cohabitating in coastal North Carolina. On your next Outer Banks vacation, take a little walk on the wild side, and spend an afternoon or evening exploring the area's most wild and largest natural landscape.